Dzongdrakha Goemba is actually a temple complex with four shrines - Drolma (Tara), Guru Rinpoche, Tsheringma (Goddess of Longevity), and Maitreya (the Buddha of the Future). It is located at a cliff which is on the western side of the Paro Valley. This place is also known by the name ‘Mini Takstang’. 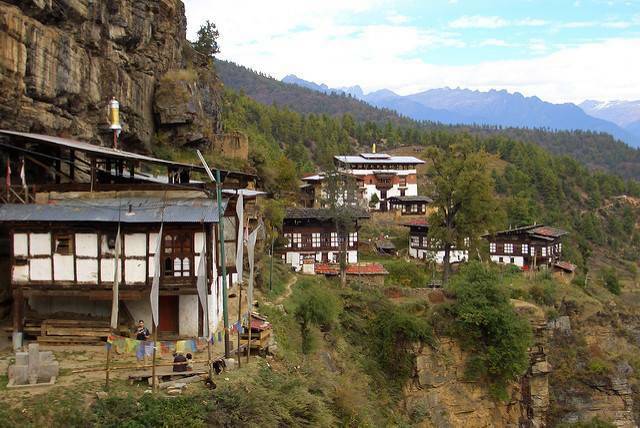 To reach this temple complex you have to drive 20 minutes from the main city of Paro. The temples are actually on a cliff above the Bondey village. While walking through the road towards Dzongdrakha you can see beautiful shrubs of Rhododendron and oak trees with Monkeys sitting on it. During the annual festival of Dzongdrakha, the main center of gathering blessings becomes the chorten (stupa) of past Buddha which gets opened so that visitors are blessed by the remnant kept there. It is also known that when Rinpoche first came to Bhutan, he landed at Dzongdrakha.